Included in Photo (From L to R): Beryl Hamabata, AVP, Branch Administration, Territorial Savings Bank; Cindy Adams, President and CEO, Aloha United Way; Robert Costa, SVP, Branch Administration, Territorial Savings Bank, and Marilyn Nimsger, Manager, Business Team, Fundraising & Major Gifts, Aloha United Way. HONOLULU, HAWAII (March 23, 2017) – Territorial Savings Bank is pleased to announce the results of its annual fundraising efforts in support of Aloha United Way and Neighbor Island United Way chapters. 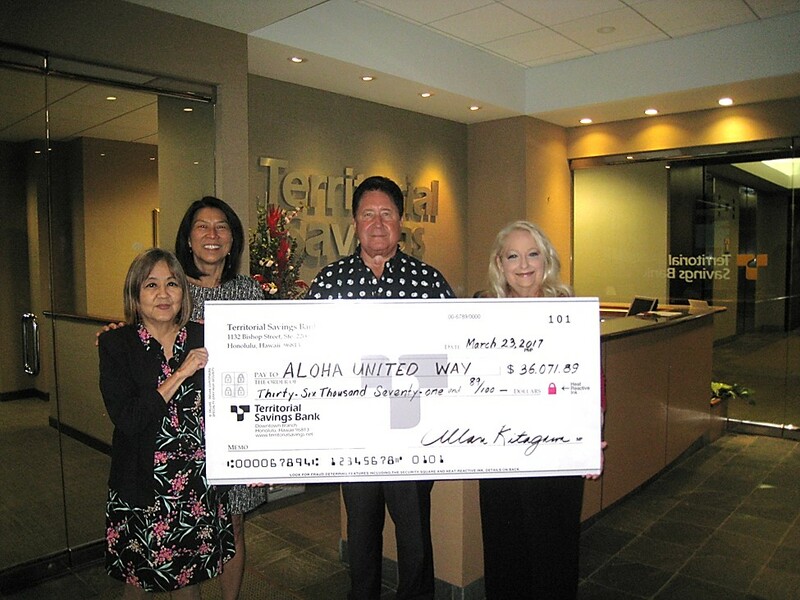 Territorial, its customers and employees raised more than $36,000 for Aloha United Way in 2016, and presented the proceeds of their fundraising efforts to Cindy Adams, President & CEO, and Marilyn Nimsger, Manager, Business Team, Fundraising & Major Gifts, of Aloha United Way, at the Bank’s headquarters in Honolulu today. “This year, we decided to get Hawaii’s Keiki involved by teaching them to save and support their communities by making donations to United Way, explained Beryl Hamabata, Assistant Vice President of the Bank. Hawaii Keiki age 5 and up, can open a Keiki Savings account at any Territorial branch. Each Keiki receives a Keiki Savers Pack including a piggy bank and other fun items designed to teach Keiki to save. “Each time our Keiki Savings customers make a deposit or a donation, they receive a small reward. It’s really a fun way for us to encourage them to save and help their communities, explains Bob Costa, Senior Vice President of Territorial Savings Bank’s Branch Administration Department. “Our Keiki Savers donated more than $1,200 this year to help families who are less fortunate. Combined with nearly $25,000 in donations raised by Territorial Savings Bank employees and just over $10,000 in corporate donations, all together, Territorial Savings Bank donated a total of $36,071.89 to Aloha United Way, $291.63 to Maui United Way, $100 to Kauai United Way and $100 to Hawaii United Way, for a grand total of $36,563.52,” explained Costa. Territorial Savings Bank began in 1921 offering home loans and savings accounts to the people of Hawaii. Today, with 28 branches on Oahu, Maui, Hawaii and Kauai, Territorial Savings Bank offers a full array of residential mortgage loans and attractive rates on checking and savings accounts. For more information, contact Maureen Lichter, Sales and Products Manager, Branch Retail Sales and Products, at (808) 951-1207.